May long weekend is coming up, which means one thing: you need a break! Have you thought about what you’re going to do? How you’re going to relax? If a break isn’t on your mind, it should be. Why? The answer is simple: to reduce your stress level and clear your head. Yesterday, my dad and me were talking and he mentioned that he was a lot angrier than normal. He was always yelling at traffic on the road and thinking angry thoughts about everyone. It suddenly occurred to me that he was dealing with cumulative stress. One issue after another had come up this week, begging my dad for solutions—work stress, home stress, stress on the road, and health stress. Over a week, all this stress starts to add up, and anger can sometimes be the result. He needed a break. There are so many ways to manage your stress, including improving your work environment, sharing your problems with other practitioners, working more sensible hours, and taking holidays, just to name a few.1 But in this post, we are just going to look at that last one. Taking holidays—and not just those two week vacations a year you more than deserve, but long weekend holidays as well. 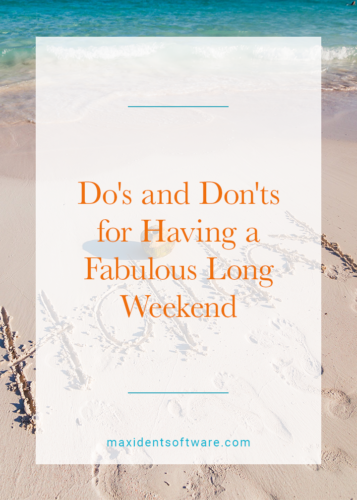 Below are some do’s and don’ts for you to keep in mind this May long weekend in order to reduce your stress, find a good balance, and come back to work recharged and rested. Of course I have to start with this one. A Three day break will provide you with three whole days to sleep in, to spend time with your family, and to give yourself a much needed break from work. In total, we all receive 9 long weekends a year, give or take and depending on which part of Canada you currently reside. That is nine opportunities you do not want to take for granted. Take this May long weekend to go to the beach, laugh, joke, and smile. By doing so you will reduce that stress and relieve some of the pressure that comes with owning and running a dental practice. You are not even going to begin to start resting until you put the phone or laptop down. You have made the conscious decision to take these three days off; the minute you start working again, your stress-level rises and it takes time before it can come down. As a writer with a full time job, I find that the only time I have to really write is near bedtime. So I start at around 10:00 p.m. I pull out my laptop, ready my fingers, and begin. It works out great. The ideas are flowing and time slips by fast. Until I decide that I’m ready for bed. But here’s the roadblock I hit: I’m wired! My brain is working on solving a problem in my writing and continues even when my laptop is shut down, the light is off, and my head is on the pillow. It can sometimes take hours before my brain is willing to let go of the problem and rest. The same goes with working off the clock. Once you’ve started, your brain is going to continue to work on the problem and it might take hours before it decides to stop and let you rest. You don’t have hours to waste, not with only three days ahead of you. Make a commitment to yourself and leave work behind. Instead, enjoy the summer sun, and relax with family and friends. Some people think checking emails isn’t the same as working. I’m here to tell you that is not true. Checking emails, texts, or voicemails presents problems for your poor brain to try solving while you’re trying to rest. And guess what—there’s that roadblock again! Even a few lines can get your brain buzzing in its attempt to work on solutions, and before you know it, you’re working. Best advice I can give is to put the phone and laptop away, and if you can’t put the phone away because it has become an extension of you, at least shut off the email notifications so the constant buzzing can’t get into your head. Now that you know what not to do to have a fabulous May long weekend, how about all the things you can do. Of course, these are only suggestions and whatever you choose to do is all up to you as long as what you choose to do makes you feel good and relaxed. If staying home is what you have in mind this long weekend, enjoy; but taking a trip out of the city is a great stress reliever. Everything stress-related is there in the city. Think about it—you have wall-to-wall traffic, your busy dental practice, and everyone related to your dental practice right there in the city. Sometimes, taking time away from the city can let you escape all the hustle and bustle of your busy life. You could benefit from sitting in silence on a beach or at a cabin away from everything that causes your blood pressure to rise. Listen to the birds sing and the wind rustle through the trees and let the city life just drain away for a while. Whether you stay home this long weekend, or you get away, remember to have a good time! If something about what you’re doing is making you tense, stop doing it. If the idea of leaving the city just doesn’t bode well with you, stay home. Do what you know is going to make you the most comfortable, the most relaxed and is going to give you the most joy. Of course I’m kidding, but breaks like this are necessary to not only manage your stress but clear your head so that when you do come back to those problems you’ve wanted to solve, you might just have a new and more effective solution. Taking a break, even a small one, allows your brain to find new avenues and pathways. So please, go ahead and enjoy yourself this long weekend! But most importantly, take a few days away from your busy dental practice and do whatever you need to do to commit to a real and well-deserved break. Happy May long weekend, everyone! See you Tuesday!